Are alpaca really easy to take care of? Do alpaca like people? Why is there so much interest in alpacas? Are alpaca dangerous? How big do alpaca get? How long do alpaca live? Are there different kinds of alpaca? How much land does it take to raise alpaca? Can I start with one alpaca? What do alpaca eat? Do I need a barn to have alpaca? What type of fence do they need? How do we get their fleece off them? How do I transport an alpaca? What about reproduction? How much do alpaca cost? Why are they so much? If I want to purchase an alpaca what should I do? 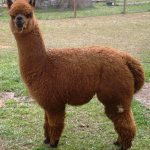 There are two types of alpacas – the Huacaya (wah-ki-ah) and the Suri (sir-e). The suri’s fiber grows quite long and forms silky, pencil-like locks. The huacaya has a shorter, dense, crimpy fleece, giving it a very woolly appearance. We have huacaya alpaca. How mach acreage does it take to raise alpacas? Do I need a barn to have alpacas? 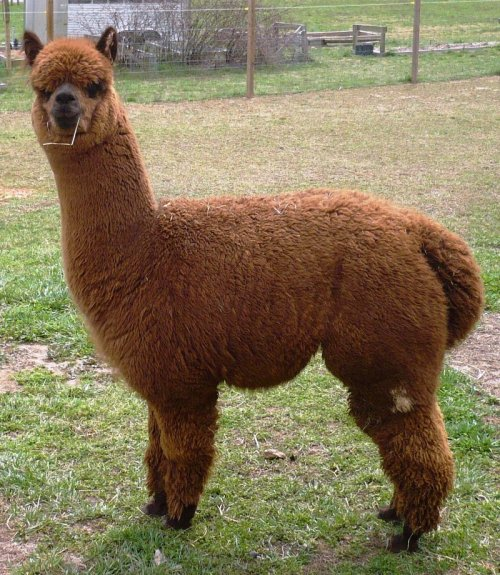 A female alpaca can start breeding between 18 and 24 months. The gestation period is 11 ½ months, yes, that is close to a year! Cria, baby alpaca, weigh between 15 – 21 pounds at birth, and are most often up and nursing within an hour. They are weaned around 6 months of age. Female will rebred between 2 and 4 weeks after giving birth, and can have a cria a year through their reproductive life. However, it is wise to give females breeding breaks. If I want to consider purchasing an alpaca what should I do? First, it is important not to jump in to any major life change without serious consideration. Visit the AOBA website and request some of the free alpaca magazines they offer. The Internet is another source of information. I hope that our website will provide you with first class educational resources and practical advise about alpacas. Attend some alpaca shows if you have the opportunity. This will give you the perfect opportunity to see some high quality alpaca. Conformation is an important part of raising alpacas, and there is nothing like a show to help you learn some of the basics. You may contact me is you have any questions rita@rdfarms.com.